** Stoichiometry is the quantitative relationship among the amounts of reacting chemical species. ** This subject provides a brief review of stoichiometry and its applications to chemical calculations. ** An empirical formula gives the simplest whole number ratio of atoms in a chemical compound. In contrast, a molecular formula specifies the number of atoms in a molecule. ** Two or more substances may have the same empirical formula but different molecular formulas. For example, CH2O is both the empirical and the molecular formula for formaldehyde; it is also the empirical formula for such diverse substances as acetic acid, C2H4O2; glyceraldehyde, C3H6O3; and glucose, C6H12O6, as well as more than 50 other substances containing 6 or fewer carbon atoms. ** We may calculate the empirical formula of a compound from its percent composition. To determine the molecular formula, we must know the molar mass of the compound. ** A structural formula provides additional information. For example, the chemically different ethanol and dimethyl ether share the same molecular formula C2H6O. Their structural formulas, C2H5OH and CH3OCH3, reveal structural differences between these compounds that are not shown in their common molecular formula. indicates that 2 moles of aqueous sodium iodide combine with 1 mole of aqueous lead nitrate to produce 1 mole of solid lead iodide and 2 moles of aqueous sodium nitrate. (1) transforming the known mass of a substance in grams to a corresponding number of moles. 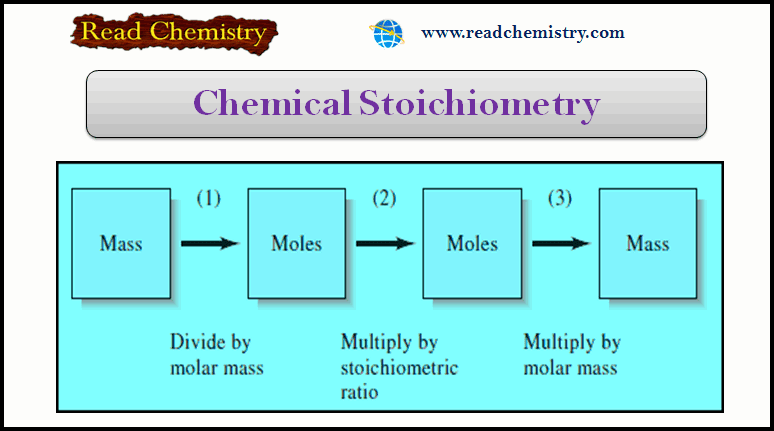 (2) multiplying the number of moles by a factor that accounts for the stoichiometry. (3) converting the number of moles back to the metric units called for in the answer. (1) When the mass of a reactant or product is given, the mass is first converted to the number of moles, using the molar mass. (2) The stoichiometric ratio given by the chemical equation for the reaction is then used to find the number of moles of another reactant that combines with the original substance or the number of moles of product that forms. (a) What mass of AgNO3 (169.9 g/mol) is needed to convert 2.33 g of Na2CO3 (106.0 g/mol) to Ag2CO3? (b) What mass of Ag2CO3 (275.7 g/mol) will be formed? In this instance, the stoichiometric factor is (2 mol AgNO3)/(1 mol Na2CO3). Example (2): What mass of Ag2CO3 (275.7 g/mol) is formed when 25.0 mL of 0.200 M AgNO3 are mixed with 50.0 mL of 0.0800 M Na2CO3? (a) An excess of AgNO3 will remain after the reaction is complete. (b) An excess of Na2CO3 will remain after the reaction is complete. (c) There will be no excess of either reagent (that is, the number of moles of Na2CO3 is exactly equal to twice the number of moles of AgNO3). As a first step, we must establish which of these situations applies by calculating the amounts of reactants (in moles) available before the solutions are mixed. Example (3): What will be the molar analytical concentration of Na2CO3 in the solution produced when 25.0 mL of 0.200 M AgNO3 is mixed with 50.0 mL of 0.0800 M Na2CO3?